Do you feel like you’re always playing catch-up with laundry? 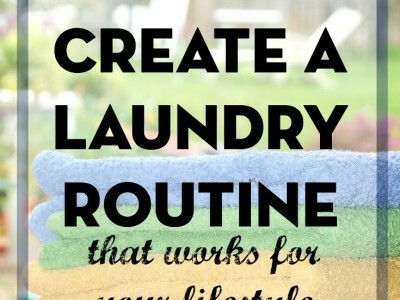 One way to get rid of the annoying-ness of laundry is to build it into your routine. By creating a laundry routine, you’ll be able to stop thinking about unfinished laundry, and relax because you know you have a system for getting it done. Daily Laundry. You can do one load of laundry each day. It’s easy to build this into your daily schedule, and it’s consistent. Laundry Day. You can set a day (or days) that’s dedicated to doing laundry. This is nice because you’re not constantly doing laundry. You dedicate one day to working on laundry, and then you can forget about it for the rest of the week. There are benefits and disadvantages to both methods. Your favorite clothes are always clean! If you want to wear your favorite sweater every other day, you can. You don’t run out of socks and underwear. If you’ve ever thought you might need to run to the store to buy a new package of socks because you have nothing clean, you’ll especially appreciate this advantage. 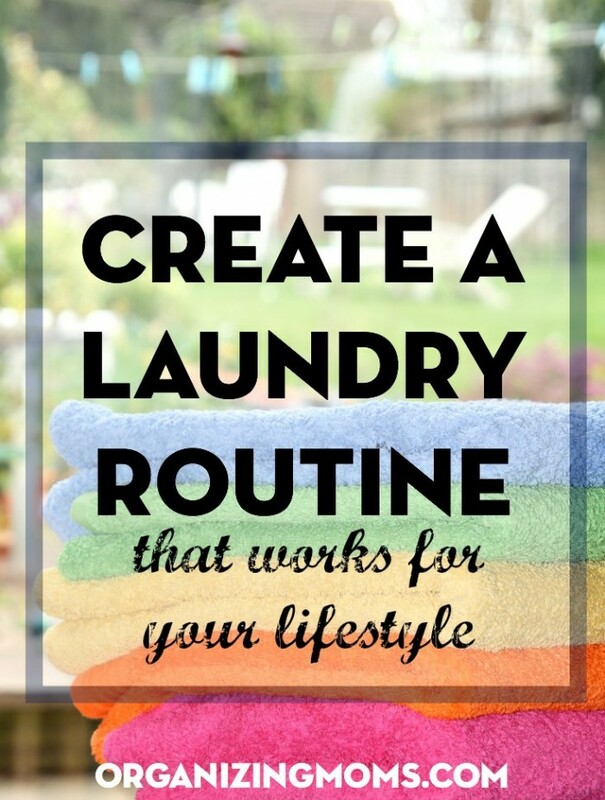 It’s easy to build daily laundry in to your daily routine. It could easily become a habit. It doesn’t take a lot of time. One load a day is pretty manageable. It’s easy to just forget to do laundry. Or leave laundry in the washer where it get smelly. It heats up your house every day. If you live in a home with no air conditioning, this can be a serious disadvantage. Especially in the summer. You feel like you’re always doing laundry. Because you are. Every. Single. Day. It may not be as energy-efficient. You may do more loads of laundry than you normally would if you did all of your laundry together at one time. You just spend one day on laundry. The rest of the week is laundry-free. This relieves you of that laundry-slave feeling. You see what clothing your family actually wears over the course of the week. You also notice what your family doesn’t wear. 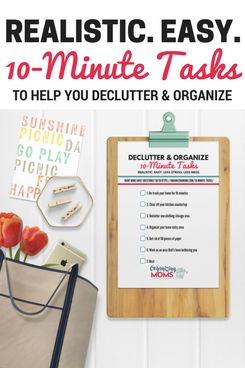 This can be good information to have when it comes time to clean out the closets. It may be more energy-efficient. Because you’re doing your laundry all at once, you can do fewer large loads of laundry. You might not wash things as much. If you know you have to wait a week to be able to wear something again if you put it in a laundry basket, you might just decide not to wash it. This encourages you to take better care of your clothing, and it cuts down on the wear and tear on clothes. It’s not foolproof. There will be laundry emergencies, and you will end up doing an extra load here and there. Laundry Day takes forever. Really. Forever. You will need to be home for most of the day. 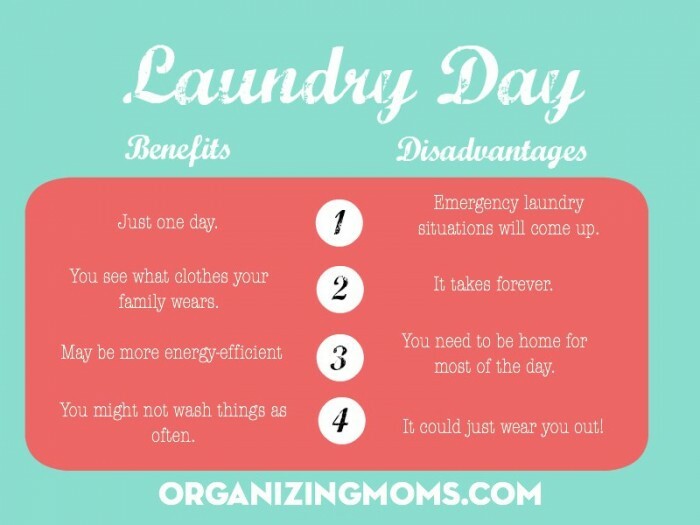 Even if you’re not actively working on laundry, you need to be around to make sure the dryer doesn’t catch on fire, and the washing machine doesn’t overflow. 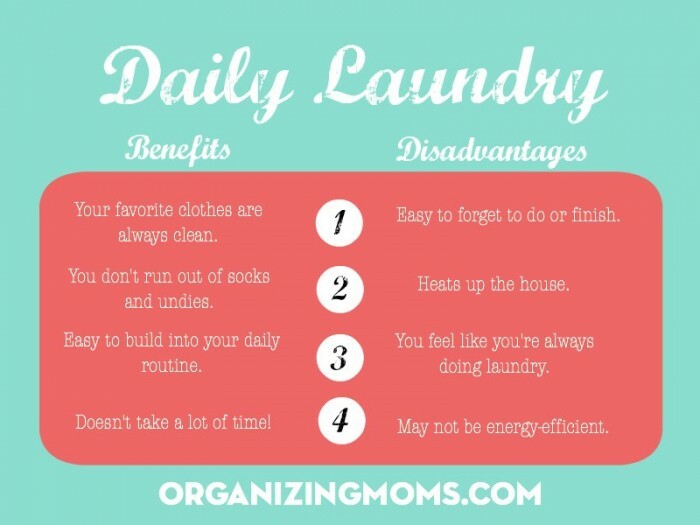 Whether you choose to do daily laundry or a laundry day largely depends on your lifestyle and preferences. I like to do daily laundry for most of the year. When it’s hot in the summer, I switch to laundry day, and I try to dry some of our clothes outside if it’s a dry, sunny day. Want to see more ideas for routines and organization? 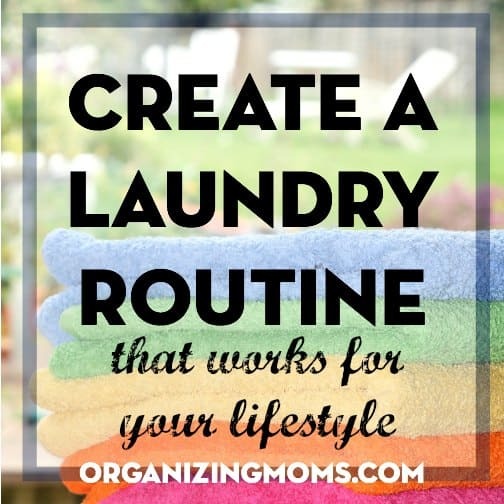 Check out the Organizing Moms Pinterest page for inspiration, ideas, and realistic solutions.